There's no better introduction to Italy than the classic itinerary of Rome, Florence and Venice. But it's not dummy-proof, which is why we enlisted three of the world's most knowledgeable Italy experts to pen this totally revised and updated annual guide. Their helpful advice and honest, opinionated recommendations will allow you to find the hidden gems that other visitors miss, avoid crowds and lines and, most importantly: plan the vacation of a lifetime. About Frommer's: There's a reason that Frommer's has been the most trusted name in travel for more than sixty years. 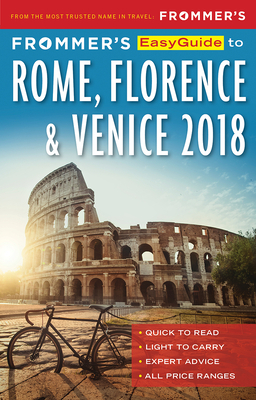 Arthur Frommer created the best-selling guide series in 1957 to help American servicemen fulfill their dreams of travel in Europe, and since then, we have published thousands of titles became a household name helping millions upon millions of people realize their own dreams of seeing our planet. Travel is easy with Frommer's. A long-time contributor to Frommer's guides, Elizabeth Heath has served as editor-in-chief to several regional magazines, and writes articles on travel, business, celebrities, politics and lifestyle for online, local, regional and national outlets. Liz fell in love with Italy on her first visit 17 years ago. She now lives in the green hills of Umbria with her family, plus five dogs, several hundred olive trees and acres of grapevines. She writes about the peculiarities of life in the Italian countryside in her award-winning blog, My Village in Umbria. Stephen Keeling has been traveling to Italy since 1985 (when a serving of gelato was 1000 lire), and covering his favorite nation for Frommer's since 2007. He has written for The Independent, Daily Telegraph, various travel magazines, and numerous travel guides as well as authored the award-winning Frommer's Family Travel Guide to Tuscany and Umbria. Stephen resides in New York City. Donald Strachan is a travel writer and journalist who has written about Italy and Europe for publications worldwide, including National Geographic Traveller, The Guardian, Telegraph, and CNN.com. He lives in London, England.